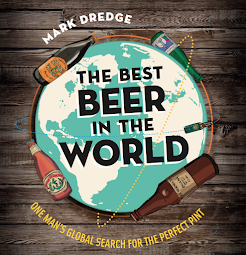 Mark Dredge - Beer: Marble Decadence Kriek: Open It! Marble Decadence Kriek: Open It! I’ve decided to make a weekend of Open It! and get through a few of the nice bottles which are in the beer cupboard. Following the action on twitter, it seems I’m not the only one taking full advantage and getting stuck into some of those beers which were gathering dust. I’ve had the Marble Decadence Kriek for ages. It’s just been sitting in the cupboard with no real to-be-opened occasion hanging around its shoulders. It’s an 8.7% imperial stout blended with kriek, a sour cherry beer (I was told what kriek it was but my booze-addled brain has completely forgotten). They also do a straight-up Decadence, which I’ve got but haven’t opened, and one blended with Frambozen, which I had months ago. When I opened the Frambozen the cork nearly blew a hole in my kitchen ceiling, so I proceeded with caution with this, making sure eyes, teeth and lights were at safe distances. It pours an oily black with a tan head flush with the pink of cherries. The kriek dominates to begin with to the point where eyes-closed this could just be a heavy-bodied sour beer, but if ever there was a case for a beer to be decanted then this is it, as over the space of a couple of hours it evolved and grew into something altogether different. Starting with sour overkill, at one point I wrote that it tastes like cheap red wine (heavy on the tongue, sharply overpowering berries, tannic) but then it all changed and mellowed and the sour went in and the chocolate underneath came out. By the end of the bottle it’s chocolate, sour cherries and almonds in near-harmony, though still a little cherry-heavy for my taste. It won’t be for everyone, given the sharp tang running through it, but it’s an interesting beer. The true test: would I buy it again? Probably not (give me the kriek and the stout separately). I’d stick to the Special (which really is special) or try the new US IPA, Utility Special, which is currently available. Or the delicious Dobber. It's not a blend of Decadence and Kriek. It is Decadence with whole cherries plus some Oud Beersel Gueuze. I've still got a couple of bottles in my cellar and it is maturing very nicely. When young it tasted like two different beers in the same glass but now evrrything is coming together very nicely. I'm really surprised that overall you weren't that keen. John, I feel some people may feel naturally antagonistic towards the project when they have to spend a couple of hours cleaning ten pounds of beer of the ceiling. JC - Cheers for clearing that up. Like I said, my beer-addled brain doesn't always get it right :) I wonder how it'll go in another year... if the cherries come through more as they did towards the end of the bottle then it could be fantastic. And I didn't dislike it, I just prefer some of their others and would rather spend the money on them. Planning on opening a couple of interesting (for me at least) bottles tonight, and will report my findings on my blog, later. I had this the other week absolutley loved the balance of sour, it was bang on for me, luckily i'd been warned about the likely hood of it exploding everywhere and managed to open it without any drama! I thought it a bit too sour. The normal Decadence is fantastic. I do take Mark's point here - it's not a beer everyone is going to fall in love with. As Dom points out it (and its raspberry equivalent) can be a bit of a gusher. What the hell is an IPA? Hair of the Dog Adam and Moor JJJ IPA: Open It! Nectar Ales Black Xantus: Open It!